Discussion in 'Birds' started by jryoung1947, Apr 11, 2007. I still don't know what to do with myself. 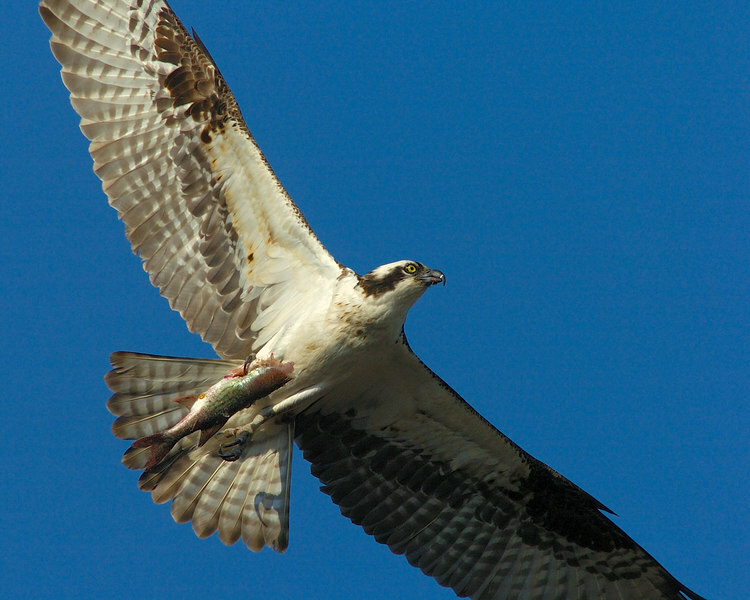 I was walking the dog and 70-300VR today and spied this Osprey. Now ozarkshome (larry) has cautioned me from taking the dog while birding buttt. Before I met you all I would not have been looking at all. The 70-300 does not quite cut it. I am not looking for "flew" and others type shots but what is hand holdable that is a bit better? I've found setting auto-iso and shutter to ~ 1/800 is about right for walking around shooting birds. The best Nikon lens for the money is the 300 f4. A bunch of Cafe shooters have posted a big bunch of outstanding images with this lens. As good as it is optically, its best feature is the price. I just bought one from a fellow member for $850. You can shoot all day with the 1.4 TC (gives you 420mm), and in good light it works well with the 1.7 (510mm). About as good a deal as you can get from Nikon. Another very good option is the 80-400VR. It doesn't work quite as well with a TC, but it does give you 400mm at f5.6, so the TC isn't as necessary. Also, CrystallP recently asked me about an auction on eBay for a 400 3.5 Nikon lens. It was more expensive ($1,500), and I don't have any personal experience with it, but Bjorn seems to like it. Finally, if you really want the ultimate, look for a good deal on a 300 2.8. This is as good a long telephoto lens optically as Nikon makes. I took over 100,000 shots with mine before I sold it to get the 400 2.8, and I have to say that I do miss it. It works well with the 1.4, 1.7, and even with the 2.0 TC's. The AF-S II version isn't cheap (look for a deal between $2,800 and $3,200), but it is the ultimate. Now, to be fair, this lens weighs a touch more than the 70-300 and costs an extra penny or 50, the superb 200-400 f4 AFS VR. AF is FAST, zoom is great, VR sometimes helps, but unless you are incredibly fit, you are not going to handhold this lens the way you would a 70-200 for example. One of the most often used examples is the Nikon 300 f4 AFS, which also works very well with the Nikon TC's. Much lighter than the 200-400 and with a much lower "entry cost". Not knowing the focusing characteristics of the 70-300 I am not sure how different that would be from the 300f4. Unfortunately Nikon does not make a "relatively" inexpensive less in the 400 f4 range as Canon does. One other alternative, which is handholdable in much the same manner as the 200-400 is the the Sigma 500 f4.5 HSM. The Sigma HSM lenses focus nearly as fast as the Nikon AFS and are built like tanks, and cost much less that the equivalent nikons. If AF speed is not the issue, then you can look at the 80-400's and the Sigma "Bigma", the 50-500, or even cheaper the Tamron 200-500, but the AF is REALLY slow, and I suspect that is your issue. Hope this helps, let us know what you are not happy with and we can be more specific with advice. Finally, if you really want the ultimate, look for a good deal on a 300 2.8. Not that I would ever disagree with Frank, and yes the 300 f2.8 is another great option, I personally put the 200-400 f4 at least equal, if not a touch above, due to the extra reach. The place the 300 wins, if you don't use a 1.4 TC, is the extra stop of light, which to be honest always helps a bit with AF. But we sure do agree on all the rest. Heck, Andreas sold his 300 f2.8 and kept the 300 f4, and if you can't trust him, then who can you trust? Flew, The old Nikon 3.5 is a super chunk of glass. It works well with the old tc`s and was much less bucks than the 400mm 2.8 and a few less lbs. I have it and both tc`s to go with it and still pull it out sometimes to shoot deer etc. It`s kind of like opening a box of 25asa kodachrome, it just feels good. I also have the 200 400 VR and just love it. Use it a lot hand held and your left arm will look like Popeye. I bought my X a Sigma 50-500 and was very taken with it. She took some very good shots with it. Yup, she took it when she split, rats! I'm not surprised concerning the 400 3.5. Just based on the pics on eBay, and Bjorn's review, it looked like a sweet lens. At about 6 lbs, it is a whole lot lighter than the 2.8. I wouldn't mind having one, but can't possibly justify the expenditure right now. Interesting perspective, and while I don't disagree, you had the lens for a day, and a cloudy day at that. I've shot the 300 f/2.8, and while it's a superb lens, more importantly, it's a different lens. It took me several weeks to learn to use the 200-400mm to best advantage. Bill's comments are dead-on about most of the differences, especially the low light issues. But one of the largest issues, IMNSHO, is that the size and heft of the lens require "training" to get best use out of it, combined with getting a good feel for the zoom function. The primes (in some cases) have similar heft, but the zoom changes the balance when shooting. One's hands just have to be placed differently to use the zoom, and readjusting from a prime to the zoom can mean slower use in some cases. As for the speed of focus, the 200-400mm f/4 AFS/VR is a bit slower than some AFS primes. The added mass of the zoom lens changes the AFS speed a bit, but in my experience, when shooting at similar apertures, the difference is not large. Of course, if one is shooting at open aperture on an f/2.8 lens, they're going to have just that bit more light, and the focus lock will be just that much faster. The old prime vs. zoom debate has many pieces and sizes to it. I think that the flexibility of the 200-400mm zoom has given me shots I couldn't have landed with a prime, especially in cases where the bird's flown directly at me and I've zoomed out, but there have also been some shots in low light I might have landed with the 400mm f/2.8. Shots like this one came from being able to zoom back quickly, and I'd have lost the shot with a prime. The 200-400mm lens suits my shooting style. And that's perhaps the key to the debate on all of this. The 300 and 400mm primes are great lenses, and the 200-400mm zoom is a great lens. And for some folks, one of those lenses will be their "best" lens. The only way to know for sure is to shoot with each of the lenses and decide what suits a person best. Having used Mike Mac's 200-400 VR a couple of times last fall, I can say that at least for me, that would be as close to perfect as I could get for a wildlife lens. Although I do like photographing little birdies, I prefer to photograph large game such as Elk, Moose, Deer, etc. I also like the large birds of prey, etc. Having the ability to zoom out as they approach is a real plus. I also have the 300 f/4 AFS lens and it's a great piece of glass. I use the 1.4 TC with it at times and although the focus hunts a bit, it's still quite usable. Definately worth the money. This is the best. What a stroke of luck to find this group! My gripe with the 70-300 is poor focus in lower light and not quite enough sharpness. Although a TC works focus is even slower and the image less sharp. When I am using it "normally" as a walk around fun lens it is perfect. Super images, look for me on "For Sale"
Well here comes the poor girl that can't afford what those boys shoot. You can do it with the 70-300VR and a kenko pro 300 1.4 tc and let the birds get closer. D200 makes a big difference with this lens. I can not handle the lenses they are talking about or affort the tripod to put them on. Look through my wild life gallerys, with and with out the tc is what I have been able to do. This is not a low light lens. You really need the right light for any good images. With any lenses. I would up grade that camera to a D200 first before any more lenses if you are going to shoot action of any kind. Try going and practicing on seagulls and you will see what I mean. 70-300 VR is a very capable lens. I don't know what your budget is. But you can work within it. I have to. 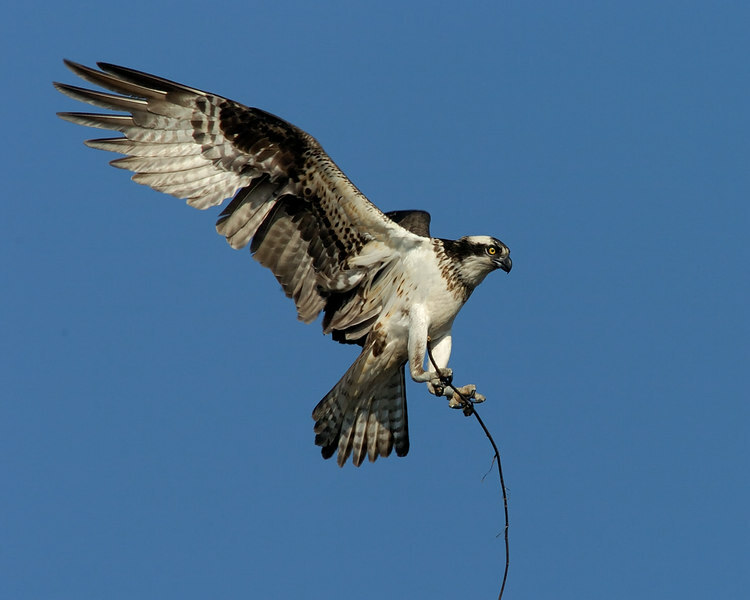 If I wasn't so dam sick this week I would go shoot a osprey in flight with the 70-300 vr and the 300f4 for you. But I can't for a few days. Thanks that is easy, cheap and quick advice. I can borrow a friend's D200. What exactly is the focus/performance advantge with the D200? It is a good first step but I am curious. I do have lens lust for the 300 f4. I can afford more I just don't want to bury myself too quickly. I take your word on the shots, don't get out of the death bed for me. Too much lens get clipped wings. Good to hear from another southern New Englander. I grew up and still have family in Waterbury and remember Litchfield quite well. I am probably going to pick up the 300 f2.8 VR. If you are interested, PM me about the 300 f4. I am probably going to sell it to finance the 2.8. D200 is a more powerful camera and will drive the lenses better especially the 80-400 VR and I will use it with the Kenko Pro 1.4 tc which gives me 600. You can pick up an 80-400 for around a 1050 these days. You might wonder when these newbee ask about a camera and I always say get the D200 and get over it. D200 has come wayyyyyy down in price. Have seen them for 1100. Well this is the exact reason. I know I will never need another camera for me. If I wear this one out, I would get another one. You know when your poor you make things work. I am danm lucky to have what I have. But most important is the D200. You need the strength of the camera when it comes to action. JR, glad this info is helping, hope it is not too much "overload". Two things I have found with shooting birds and other moving objects that really help regardless of how quickly the lens will focus. The more you watch the subjects, the better you can get at anticipating what will happen. And I'll venture to guess that not one of the people who has popped an image into this thread, or who shoots these types of subjects with whatever lens, will tell you that they don't get their fair of "stinkers", I sure know that I do and sometimes they are great for a laugh :biggrin:. The second part is technique. Remember the 1/focal length rule for shutter speed, and don't forget that even with VR lenses good hand-holding technique is crucial. This takes practice, and then more practice, then you practice again and still complain about OOF shots! I don't know how long you have tried, but you may want to give this a bit more of a shot prior to a change. On the D200 and AF, remember that there are 2 parts to this equation. First is the AF module itself, and how quickly and well it can deal with focus. Both use the CAM1000 AF module, so I would expect that you would not see a big difference here. And the 70-300 is an AFS lens, so in-camera motor won't come into play here either. I think a test with a D200 can't hurt, and I'll be really interested in your results. From the specs, I would not expect much difference between them. Now, one other thing that I, and others, have found over the years is the use of the AF-On button on the back of the camera vs. using the shutter button for focus. Not sure if you do this or if you can with the D80, but if so give it a shot. I find it especially useful with VR lenses, so you are not constantly having VR engaged while you are initially tracking. I have myself screwed up shots with the VR on when using the shutter button for focus. Some people think this is a big "no-no". I am one of those who don't. We recently had a showing of award winning pictures at one of our local museuems. 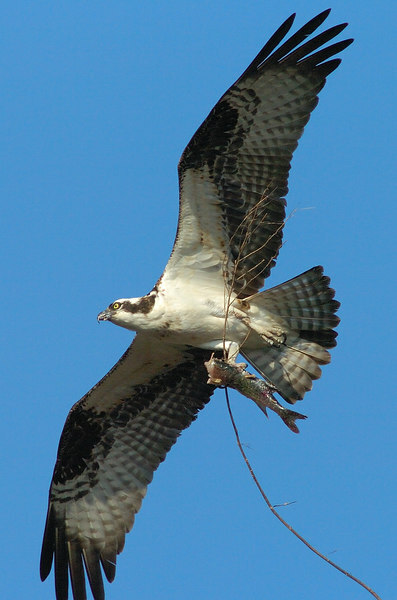 Almost every single image of a bird had a "wing clip". As a number of folks have told me over the years, judicious use of a "clipped wing" can add tension to the image and also help to draw your eye down to the main subject. Gale, see my comments re: differences between the D80 and the D200. As noted, I think it is an experiment worth doing. You bring up a GREAT point regarding patience, this can't be stressed enough. How many of us stand/sit for hours just waiting for something to occur? :wink: Do you have any feel for the AF speed difference between the 70-300 and the 80-400? Did someone mention clipped wings?? ?